Recently, it was reported that a 6 month old baby was admitted to hospital following life threatening seizures. Her mother had reportedly replaced some of her formula feeds with cordial as she was unable to afford to buy sufficient formula. It’s important to note that the cause of the seizures was the water in the cordial- as opposed to the cordial itself- generally speaking, babies get all their water from formula or breastmilk. From all I have read, it’s very easy to overdose a baby under 12 months on water. Doing so can lead to a condition called water intoxication, where excessive water consumption leads to sodium being flushed out of the body which disturbs brain activity and results in seizures. This condition is potentially fatal. I don’t know why this mum thought that cordial was a suitable substitute. I have no idea of her situation. I can think of many scenarios to explain it and many that do not but I don’t have the all the facts. One thing that is blindingly obvious though is that she did not have the education and support she needed to safely formula feed. I always talk about the education and support needed to breastfeed, because I needed a lot of both to do it successfully. When I bottle fed my eldest, it wasn’t terribly difficult. I didn’t find I personally needed much help- a midwife explained how to sterilise bottles, recommended a good brand of bottle and a type of formula, told me to follow the instructions on the tin and off I went. Other than mild reflux, we didn’t have a great deal of feeding issues once on the bottle- but that is just my experience and obviously it really isn’t the same for everyone. In the ensuing discussion over this mum, I’ve seen people say how much they struggled with formula feeding- from finding the most suitable formula to the most suitable teats and bottles for their babies- reflux babies, colicky babies, windy babies, babies prone to constipation or it’s opposite, babies with CMPI– they’re all different and all need something different. One woman recalled spending upwards of $50 on teats alone when she switched to formula in her search for one that suited her baby. The articles I read stated that this child was initially breastfed until around five weeks of age (a noted fussy period, from memory) and the author connected this case to the poor rates of breastfeeding in Australia, saying that mothers are being pushed or recommended too early on to wean onto formula. The article quoted a statistic too- that although around 90% of mothers initiate breastfeeding, only 15% are still breastfeeding at 6 months. While I agree that many mums switch to formula very early on (and there are many reasons for this) what the article didn’t mention was that this statistic refers to exclusive breastfeeding– which means the baby has had nothing but breastmilk, excluding medications and vitamin supplements- so it’s misleading because many people start to introduce solid foods between 4 and 6 months of age. So while it’s true that only 15% are exclusively breastfeeding at 6 months, the percentage of those still breastfeeding while introducing complimentary foods is likely higher. To get an idea of our rates, at 3 months old, it’s it a rate of around 39% that are still being exclusively breastfed. (I imagine there are very few babies being given foods at this age-I hope, anyway- so by not being exclusively breastfed we can assume they are on some if not all formula). By 12 months (the minimum Australian recommendation) only 28% are still breastfed (which is still higher that the 15% quoted by the article) so we can estimate that somewhere between 28% and 39% are actually receiving some breastmilk at 6 months of age. This drops to around 9%at 18 months and 5% by 24 months (the minimum World Health Organisation recommendation and a whole other topic). It may be true that this wouldn’t have happened if she was still breastfeeding. It may be that she was advised to stop breastfeeding at 5 weeks. She may have complained about the increased fussiness to her GP who recommended weaning. She may have had a friend tell her that formula would lead to a more settled baby, she may have read something similar online- we don’t know. Perhaps she had to stop for medical reasons, perhaps she just didn’t want to breastfeed any more, as is her right. Is this where she was let down? Breastfeeding mums have the ABA to turn to and lactation consultants- where does the bottle feeding mum turn to if things aren’t going well? Some women I spoke to said that they struggled to get bottle feeding information as nurses and midwives were reluctant to give it out, citing hospital policies as a reason. 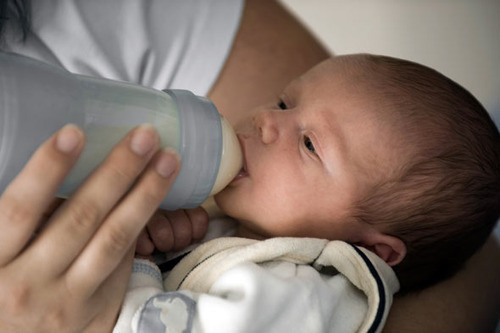 Others said they felt judged for bottle feeding, despite the fact that most Australian babies are formula fed for most of their first year of life, and were therefore reluctant to ask anyone. All that aside, it’s not useful to turn this sad situation into a breast vs bottle argument. This happened not because of formula or because breastfeeding had ceased- it happened because a mother did not know what else to do when she couldn’t afford to buy enough formula. So where to go for help? Your Childhood Health Nurse should help you. Your GP should help you. Your Paediatrician can help too. But if for some reason you don’t want to ask, there are lots of online resources. There are forums and Facebook pages where you can talk to other mums. There are some great online resources. Similar to getting breastfeeding information and support, sometimes you just have to take the bull by the horns and seek it out for yourself. Don’t have internet access? How’d you get here? (Kidding! But maybe you don’t have regular access or want to help someone that doesn’t?) The good news is that most public libraries provide free internet, which is fantastic on many levels. I didn’t know that until recently- spread it around! NB- If you are in financial difficulty and can’t afford food or formula organisations like the Salvos and FoodBank may be able to help you or point you in the right direction. You might feel there is shame in asking for help but there is not. Nor is there any pride to be had in starving. There are people and organisations that are there to help you get back on your feet.